The Anaheim Ducks’ playoff odds just took a major hit. The team has announced this evening that young forward Ondrej Kase suffered a torn labrum in his shoulder in last Thursday’s game against the Minnesota Wild. The injury will require surgery, scheduled for next week, and Kase will miss the next five to six months for recovery. His season is over. Kase, 23, had been on pace for the best season of his career despite missing 20 games already. In the 30 games he had played for the Ducks, Kase has registered 20 points and trailed only Ryan Getzlaf in points-per-game for the team. Kase is developing into dynamic right wing and a dependable one at that. In the first season of a three-year extension worth $2.6MM against the cap each year, Kase is already looking like an immense bargain for Anaheim. However, the concern moving forward is whether the upstart Czech winger can stay healthy. Yet, the more pressing concern for the Ducks is their fate this season. GM Bob Murray has been busy lately reshaping his roster for a playoff push, but he likely won’t be able to replace Kase’s production internally and probably will be unwilling to pay the price to replace him via trade. Fortunately, Corey Perry, Patrick Eaves, and Jakob Silfverberg should all be back in the lineup sooner rather than later, providing a nice boost up front. However, Anaheim is one of seven teams currently competing for just two wild card spots in the Western Conference and likely needed their team at full strength – including Kase – to ensure they were able to secure a playoff berth. This injury could convince Murray to swing another deal or instead could switch the Ducks into selling mode. Only time will tell, but no good will come from losing the scoring punch that Kase provided. The Anaheim Ducks are keeping busy in the slowest part of the summer, finally reaching terms on an extension with restricted free agent forward Ondrej Kase. The team has announced a three-year deal with the young right winger, who set career highs across the board last season. Beat writer Eric Stephens adds that the contract carries a $2.6MM AAV for a total of $7.8MM over the three-year term. Kase, 22, has developed well beyond anyone’s estimations since he was selected in the seventh round of the 2014 NHL Draft. He not only debuted in the NHL just two years after being drafted, but played in 53 games with the Ducks in 2016-17. He followed that up with a sophomore campaign last season that more than doubled his production over 66 games and showcased a more well-rounded skill set. Kase scored 20 goals, tied for second-most on the Ducks, and totaled 38 points overall, fifth-best for Anaheim. Additionally, he led all Ducks forwards but Ryan Getzlaf in plus/minus. Perhaps most impressive, Kase topped all Anaheim skaters in possession, with a 52.9 Corsi (CF%). The Czech native has natural offensive instincts and possesses a high-end hockey IQ unbecoming of a player selected in the 200’s of the NHL Draft. Moving forward, he should continue to grow into a scoring weapon and should be given more ice time and a greater special teams role for Anaheim after last season. If Kase continues to exceed expectations, GM Bob Murray and the Ducks will be very happy to have him at such a low cap hit in two or three years. As Anaheim’s old guard – Getzlaf, Corey Perry, and Ryan Kesler – only continue to slow down, Kase looks to be a key piece of the young core coming up behind them. Nothing went exactly the way that Arizona Coyotes goaltender Antti Raanta had hoped in the first half of the season. However, one thing the goaltender hopes is that he can prove to his team that he is a number one netminder, something he hasn’t accomplished so far this year, according to Arizona Sports Craig Morgan. Acquired as part of a major package this offseason along with center Derek Stepan for defensive prospect Anthony DeAngelo and the seventh-overall pick in the 2017 draft (Lias Andersson), Raanta was supposed to make people forget about longtime veteran Mike Smith, who the team traded to Calgary in the offseason. Instead, Raanta has spent quite a bit of time on injured reserve with two lower-body ailments and a concussion and has only appeared in 21 games, posting a 2.82 GAA and a .915 save percentage. The 28-year-old netminder will be an unrestricted free-agent this summer and the team must decide over the next three and a half months whether Raanta is their goalie of the future and if he is worth locking up to a long-term deal. Eric Stephens of the Orange County Register writes that Anaheim Ducks winger Corey Perry is set to return to the Ducks lineup tonight after missing 11 straight games with a knee injury. 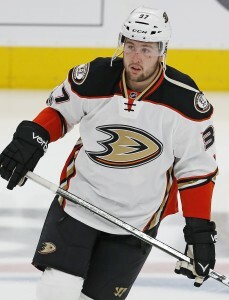 This will be the first time this year that Perry will get an opportunity to play with Ryan Kesler and Ryan Getzlaf. Kesler came back on Dec. 11, the same day that Perry went down, while Getzlaf hadn’t returned at that point. The three made one of the top lines in hockey in recent years. In 31 games before the injury, Perry has six goals and 16 assists. While there is no timetable for his return, Jon Rosen of LA Kings Insider writes that Los Angeles Kings veteran center Jeff Carter has been much more visible in the last week. He’s shed the Roll-A-Bout and crutches and is walking around without a boot. He has suffered no setbacks so far since he was injured on Oct. 18 and required ankle surgery. “Progression-wise and everything he’s doing right now shows he will be back this season,” Blake said. One fact about the six-year, $30MM contract that Vegas Golden Knights winger Jon Marchessault signed earlier this week is that it has a modified no-trade clause in it, tweets SinBin. Details on the specifics of the NTC, however, is unknown, according to CapFriendly. The Ducks have seen some of their walking wounded return in recent days (including winger Ondrej Kase tonight) and it appears that they’re getting closer to getting a couple of key centers back. GM Bob Murray told Mike Coppinger of the LA Times that they believe that Ryan Getzlaf and Ryan Kesler will be ready to return by the time Anaheim’s next road trip starts (which is December 14th). Getzlaf got off to a strong start to the season with seven points in seven games before suffering a facial injury that required surgery. Meanwhile, Kesler has yet to play in 2017-18 after undergoing hip surgery in June. That’s not the only good news on the injury front either as Coppinger adds that the Ducks are also expected to welcome back winger Rickard Rakell on Tuesday night. If that happens, he’ll wind up missing four games with his upper-body issue. It wasn’t long ago that Anaheim was lacking for offensive threats but within the next couple of weeks, that should change considerably. Although he was acquired more than a week ago, Kings center Torrey Mitchell has been waiting for a work visa before he could suit up. Jon Rosen of LA Kings Insider reports (Twitter link) that he has finally received it and will be eligible to play. In a follow-up tweet, Rosen notes that Mitchell will fly to Chicago and meet up with the team there in advance of their matchup there on Sunday. Avalanche center Colin Wilson missed his second straight game tonight against the Devils. BSN Denver’s Adrian Dater suggests that head coach Jared Bednar was hoping he’d be able to play but now they’ll target Sunday as a return date from this undisclosed injury. Wilson’s first season in Colorado has been a quiet one as he has just a goal and four assists in 16 games. Jets goaltender Steve Mason is feeling better as he recovers from his concussion, head coach Paul Maurice told reporters, including Ken Wiebe of the Winnipeg Sun (Twitter link). He has had multiple days with no setbacks which is certainly an encouraging sign although there is no timetable for his return. As the holiday season approaches, PHR will look at what teams are thankful for this year. There also might be a few things your team would like down the road. We take a look at what’s gone well in the first month and what could improve as the season rolls on. What are the Anaheim Ducks most thankful for? Still being in the hunt after so many injuries. From the time the Ducks were knocked out of the 2017 playoffs, the injuries announcements have never ceased. First it was Hampus Lindholm and Sami Vatanen needing shoulder surgery. Then Ryan Kesler needed hip surgery. Just after the season started Patrick Eaves was diagnosed with Guillain-Barre Syndrome, and then Ryan Getzlaf took a puck to the face that required surgery. Add in more major injuries to Cam Fowler and Ondrej Kase and the team should be at the very bottom of the standings were it not for some incredible depth. 7-7-3 isn’t where Randy Carlyle and the front office expected to be after 17 games, but they’ll take it considering how the last few months have gone. Who are the Ducks most thankful for? Rickard Rakell and Brandon Montour. Everyone knew how talented Rakell and Montour were, but no one expected them to put the team on their back like they have. Rakell is playing more than 20 minutes a night and leads the team in scoring, while Montour showed off his top-pairing upside prior to Lindholm and Vatanen’s return. While he’s now settling into a more reasonable role, the future holds bright things for Montour. His five goals and nine points both lead the Ducks defense corps, including tallies in all situations (even strength, powerplay and short handed). What would the Ducks be even more thankful for? A step forward by Nick Ritchie. Even with the opportunity afforded him with injuries, Ritchie has been a disappointment this season for those who expected him to take a step forward. Selected 10th-overall in 2014, he has just four points this season and has been demoted to the fourth-line. His ice time was limited to fewer than ten minutes in each of the last two games, and he has just a single goal on the year. Ritchie will turn 22 in a few weeks, and the Ducks will need more out of him as the season goes on. Right now even his 28 point mark from last season seems far-fetched unless he gets back to the attacking, power game he showed in spurts last season. He’ll need to get back in Carlyle’s good books to do so. What should be on the Ducks’ Holiday Wish List? Another reliable option at center. The Ducks came into the year with questions at center behind Getzlaf and Kesler, and the injuries have only exacerbated those depth issues. They currently have the imposing quartet of Chris Wagner, Derek Grant, Antoine Vermette and Kalle Kossila down the middle, which just isn’t going to cut it. Sure, Getzlaf and Kessler will be back at some point but if they truly want to compete in the playoffs this season they’ll need to add at some point. The question will be what the Ducks are willing to give up to acquire that center, as the 2018 draft is shaping up to be exceptional. First-round picks (even late ones) are worth a lot, and most of the options down the middle are on expiring contracts. They decided that Eaves was worth the loss last year, and even re-signed him this summer to a three-year deal. Is it worth it again to provide some backup for their top two pivots? Remember that Anaheim already lost some of their defensive prospect capital when they moved Shea Theodore to the Vegas Golden Knights. While moving Vatanen at one point looked like a lock given what was coming up behind him, they don’t look quite as deep at the position anymore. That said, the team has several tough financial decisions looming over the next couple of summers—Montour, Ritchie, Kase, John Gibson, Andrew Cogliano and Jakob Silfverberg all need new contracts before 2019-20—making the idea of shedding money from the back end a little more enticing. The hits just keep coming for the Anaheim Ducks. Today, the team announced that Ryan Getzlaf has undergone surgery on his zygomatic (cheek) bone and will be out up to two months. Getzlaf was hit in the face with the puck on October 29th against Carolina, and had the surgery yesterday to repair a fracture. This is just the latest in what has been an incredibly injury-filled season so far for the Ducks, who are still without Ryan Kesler and Cam Fowler long-term. Getzlaf’s absence has been tough on the Ducks, who had questions about their center position even before losing their top two options. The team has had to rely on players like Derek Grant and Antoine Vermette to pick up the slack, but could eventually need to look outside the organization for some help. GM Bob Murray did tell Eric Stephens of the Orange County Register that Kesler and Fowler were progressing, but even when he gets back into a game it will likely take some time before he’s at full strength. Kesler hasn’t played this year following hip surgery, and back in September the hope was to have him back by Christmas. If the Ducks do go outside the organization, they don’t have a ton of cap space to play with. Interestingly, Elliotte Friedman of Sportsnet reports that the Ducks tried to acquire Vadim Shipachyov from the Vegas Golden Knights, but couldn’t get around the issue of the bonus repayment. Had he been moved, the Golden Knights wouldn’t be entitled to the nearly $2MM that Shipachyov will give back as he files his retirement papers.